Much awaited series between Pakistan and South Africa is starting from Monday 14th October when Pakistan will take on South Africa in 1st test match in Abu Dhabi. the match will start at 11 AM. It is a long series that contains 2 tests, 4 ODIs and 2 T20 matches. Currently Weather of UAE is really hot which means this series will not be easy for both sides. South Africa is currently ranked No. 1 Test team while Pakistan is on the 6th place. 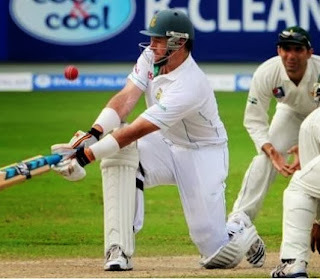 Pakistan is also going to try many new players which means facing South Africa will not be easy. earlier this year in February Pakistan also lost test series to South Africa. However record of Pakistan is always been good while playing in UAE. Pakistani spinners specially Saeed Ajmal also performs well in UAE. head to head both teams have played 21 test matches. Pakistan won 3 while South Africa won 11. 7 matches ended without any result. these records are telling the whole story that South Africa has got edge over Pakistan. Pakistan's test squad Includes Umar Amin, Rahat Ali, Khurram Manzoor and Adnan Akmal which are not much experienced. Abdul Hafeez is not part of Pakistani side due to his poor performance this year in tests. hopes are with Captain Misbah Ul Haq, experienced Younas Khan, Fast bowler Mohammad Irfan and Spinners Saeed Ajmal and Abdur Rehman. on the other hand South Africa got many big names like Graeme Smith, Hashim Amla, Kallis, Faf du plessis, Dale Steyn, AB De Villiers and spinner Imran Tahir is also part of the squad. Clearly South Africa got the edge but Pakistan has got the ability of shocking anytime specially while playing in UAE.